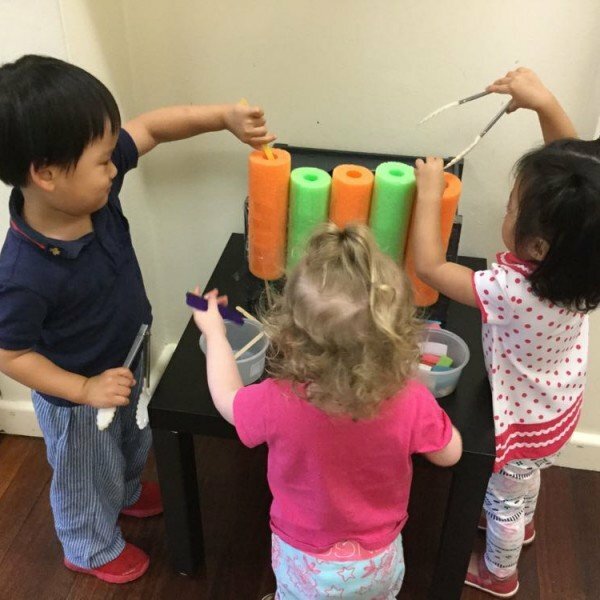 Recently the children in Johnson House toddlers have been very enthusiastic about engaging in sensory and fine motor play experiences. The children had the opportunity to use the tongs to extend their interest in these experiences. The educators set up a table with tongs, sticks, corks, small wooden blocks and foam pipes. 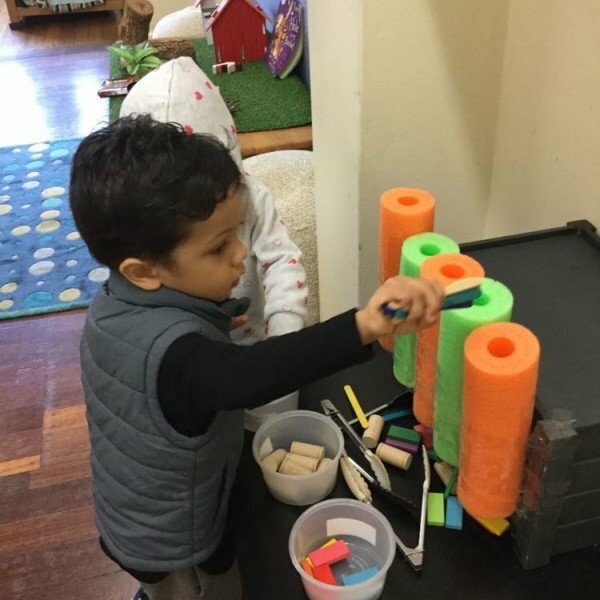 Some of the children used the tongs to pick up the objects and put them into the pipes, while others were happy to use their fingers to do it. The children in Johnson House preschool have recently been interested in the topic of ‘space’. 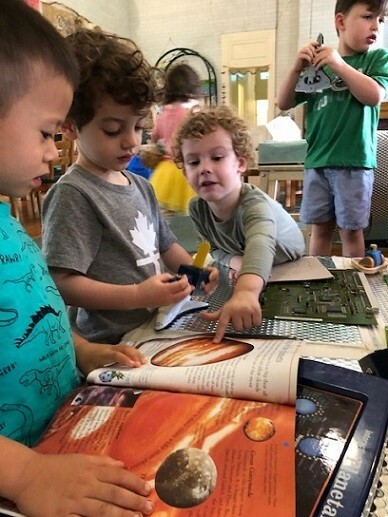 They helped set up a space focused learning environment, and were actively involved in learning about many aspects of space including what astronauts do and the names of the planets in our solar system. 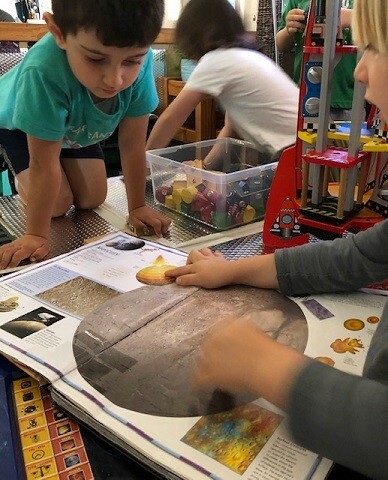 Relevant nonfiction books that were placed in the in the learning environment provided children with opportunities to enhance their knowledge and understanding. They asked questions, and shared their previous understanding about planets and space with each other. 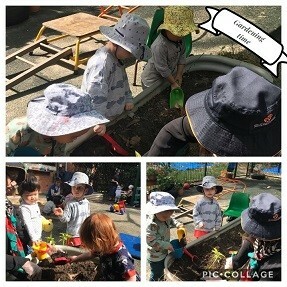 The children were also keen to engage in dramatic play in the area, pretending to blast off into space using the rocket, making satellites using the construction pieces and developing a range of ideas to enhance their play experience. 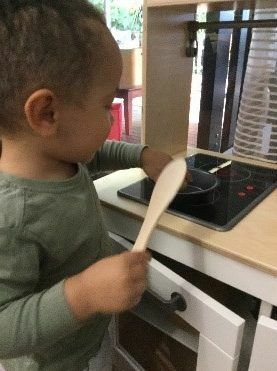 A new kitchen with utensils has been created in the Murray House infants’ room this week, and the children have been showing great interest in the new learning environment. The children seemed to be interested in seeing the things inside the cabinet door, opening and closing showing curiosity. They were excited to participate in pretend cooking by adding the ingredients by scooping and pouring with the utensils. The children used language in their play, and described their actions and the kinds of food that they were making. The new kitchen has facilitated a variety of play and learning experiences as the children continue to revisit the space. 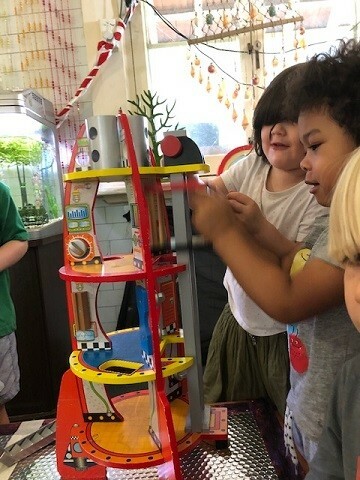 They dramatised familiar experiences such as cooking, participated in collaborative play using language, and demonstrated developing motor skills. 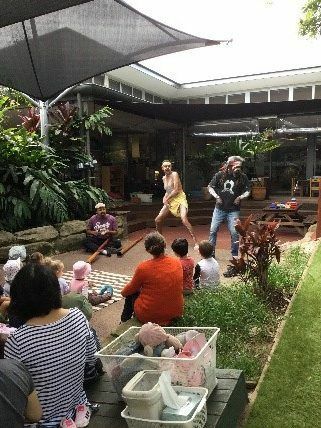 Uncle Terry brought two friends who are also Aboriginal artists with him to Murray House this week to perform different renditions of Aboriginal songs and dances used in traditional ceremonies and other special events that the children are already familiar with. These included the Jalama, Sasa and Kangaroo dances. They also introduced new songs and dances such as the Rainbow Lorikeet, Rainbow Serpent (Yeli-Yeli) and a song about their journey from the Western to the Northern islands. The children shared their Acknowledgement of Country and sang the Wangal Land song for their visitors. The songs and dances taught us about some lessons that are central to Dreamtime stories, and our visitors also taught us some new words, such as “yarloo” which means “thank you”. They explained to us that after their performances, we should say “yarloo” instead of clapping our hands. Other new words we learned, included “oool baloo” (I love you), “yidaki”, which is the Aboriginal term for didgeridoo, (the word ‘didgeridoo’ originated from the Scottish people to denote the sound of blowing the pipe. They also called the kangaroos “bunda” and said “ginenmanen” which meant see you later. Uncle Terry wore his traditional costume and painted his face and body, and the other artists’ faces, with white ochre paint. Other groups of children from Robinson House and Gorton House were invited to join us for this opportunity to learn more about Aboriginal history and culture. Tomorrow March 30 is Earth Hour (8.30pm-9.30pm). This wonderful event, with its origins in Australia, has now grown into a global event which promotes awareness about environmental issues. In Rigby House sustainable practices are an important part of our curriculum. Our educators model practices that are respectful and caring of our environment. The children are familiar with sorting our waste into: items which can be recycled, item which can be re-used, and items that need to go into the general waste red bin. The children also save water by not letting water run unnecessarily and pouring left over water into our gardens so that our plants can ‘have a drink of water to make them grow.’ Recently the children have helped to germinate seeds and prepare our garden beds for winter vegetables, and they are now caring for the new seedlings they have planted. 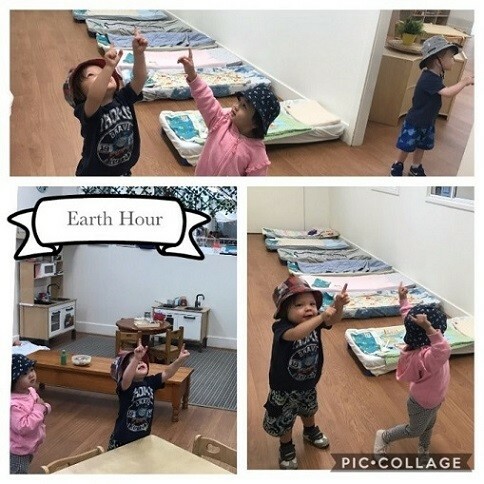 Every day we practice ‘Earth Hour’ by turning off the lights in the room during lunch time. The children are also getting used to reminding the educators to switch off lights if they are leaving a room and no else is using it. Many of our children are still very interested in the beach and marine creatures. Our educators explain to the children that by looking after our environment this will also help to keep the ocean a safe place for the animals and plants that live in it. The children have been expressing these ideas through art experiences. 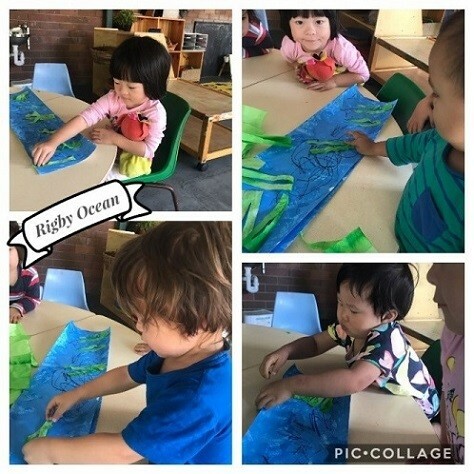 They have explained that the water is clean and that seaweed grows there and they also described the variety of fish and other creatures that live in the ocean. All the little things that we do make a big difference, and it is important for our young children to feel connected to nature and be empowered to take action to protect our earth. Each day in our gathering groups at Robinson House we sing a range of greeting songs. One song is “I am Australian”, by Bruce Woodley. Through singing this song consistently the children now know that we all live in Australia and we are all Australians. The song is a great opportunity for us to regularly discuss diversity and the importance of respecting difference with the children. Through these discussion the children have learned to acknowledge their self-identities as well as those of others. They have learned to respond to diversity with respect, and they all experience a sense of belonging to our Robinson House community. 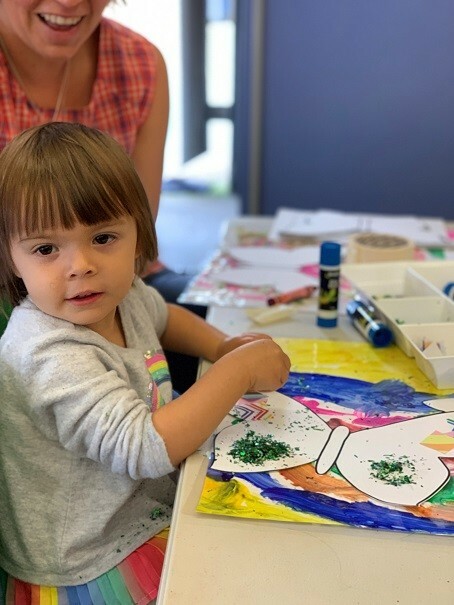 As an extension on these discussions with the children about diversity Thi My, one of our Early childhood teachers, has been working on a ‘belonging’ canvas with them. She drew a map of Australia on the canvas and explained that the lids are different in shape, colour and size and they represent the many different people of Australia. 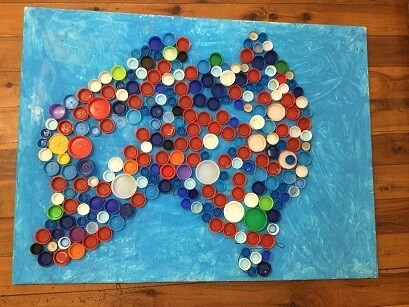 The children were encouraged to choose lids to put on the map of Australia. Throughout the experience the children and Thi My spoke about the differences amongst themselves, even though they all belong to Robinson House. 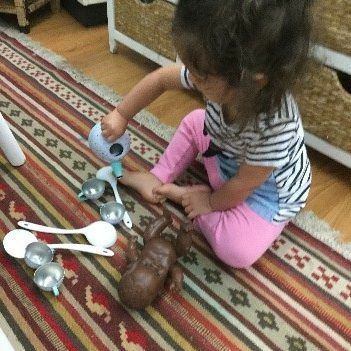 This beautiful photo is from one our Family Day Care Educators, Fae, who is celebrating Nowruz (Persian New Year) with the children in her service. Nowruz is the day of the Vernal Equinox (21 March); the beginning of Spring in the Northern Hemisphere is marked with the sowing of wheat seeds and decorating eggs to symbolise new life and new beginnings. Nowruz is celebrated worldwide by various ethnolinguistic groups, with its basis in Iranian and Zoroastrian origins. Fae is originally from Iran and will often share aspects of her culture with the children and families in her services as part of her educational program and practice. 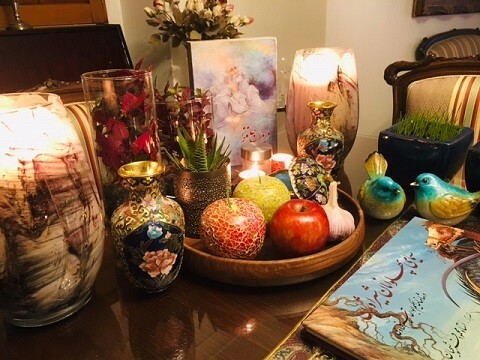 Fae intends to build upon the children’s knowledge of Nowruz and help them to make connections between this important religious festival and another important religious festival, Easter. It is through this type of intentional teaching that our educators are sowing the seeds of celebrating inclusiveness and diversity within their services and helping our children to accept and embrace all cultures. 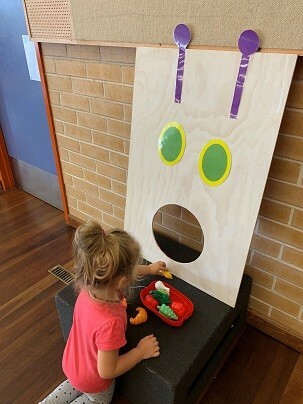 This week the children at playgroups have enjoyed the story of the Very Hungry Caterpillar. They made caterpillar necklaces using pasta, and butterflies and caterpillars were created at the craft table. 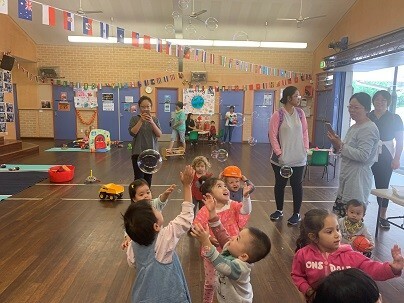 The children also danced with rhythm sticks and enjoyed bubbles, and sand play, playdough, sorting, reading and building are all fun activities where the children have been able to meet other children and make friends. 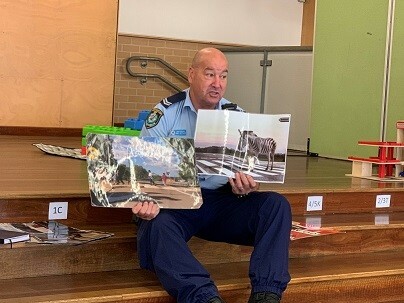 This week the Wangal playgroup at Ashfield Public School had a visit from Constable Jim from Burwood police. He spoke to parents and carers about how to keep their children safe by helping them to identify safe people in the community and safe places to go when they are lost, feeling unsafe or frightened or are in danger. Walking with a friend or group of friends is safer and more fun. Always look left and right for traffic before crossing the road. Always use a pedestrian crossing. Know the people in your community you can trust. These could include teachers, doctors, nurses, shopkeepers and police. Find places you feel safe that you can go to when you feel unsafe or unsure, for example, a hospital, school, shops, neighbours, friends, police station. Never talk to strangers or get into strange cars. When on the train, travel in a crowded carriage or in the guard’s compartment (one with the blue light). Try to always walk where there are lots of people. Remember, it’s ok to say NO if you feel unsafe or unsure. Call 000 if you are scared or in danger.